Description: ALP-46 # 4602 pulls a Trenton bound train past Rahway station. Description: ALP-46 # 4602 pushes a New York bound train out of Rahway station. Description: ALP-46 # 4602 passes thru N. Elizabeth, N.J. on a Sunday afternoon headed for N.Y.C. Description: NJ Transit ALP-46 #4602 pulls a Southbound train over the Sycamore Ave. Crossing into the Little Silver NJ Train Station. Description: NJ Transit ALP-46 #4602 pulls into the Elizabeth train station. Description: NJ Transit ALP-46 #4602 leads a eastbound train over the White Rd. Crossing in Little Silver NJ on the North Jersey Coast Line. Description: NJ Transit ALP-46 #4602 leaves Red Bank NJ with a Multi-level Consist. Description: NJ Transit ALP-46 #4602 comes back with the Multi-level consist. The train did not stop in Red Bank. Description: NJ Transit ALP-46 #4602 leads a eastbound train into the Little Silver Station. Description: The NS H02 with red Conrail hack waits in Summit Yard as a westbound New Jersey Transit train pulls into Summit Station. Description: NJ Transit ALP-46 #4602 arrives with a train at Princeton Junction. Title: NJT 4602, 4302 the Harrison "protect" engines. Description: NJ Transit ALP-46 #4602 departs Middletown with eastbound train to New York. 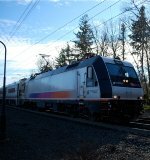 Description: NJ Transit ALP-46 #4602 at the end of a Westbound train. Description: NJ Transit GP40PH-2B #4200 and ALP-46 #4602 sit on track 10.